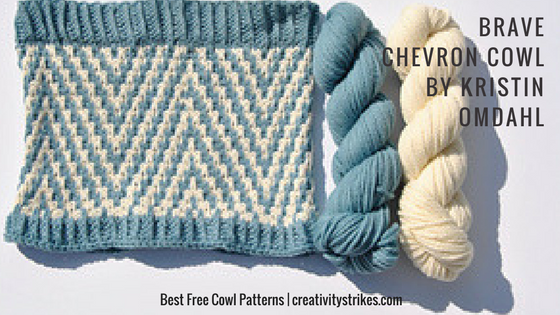 Best Free Cowl Patterns on Ravelry - Creativity Strikes! 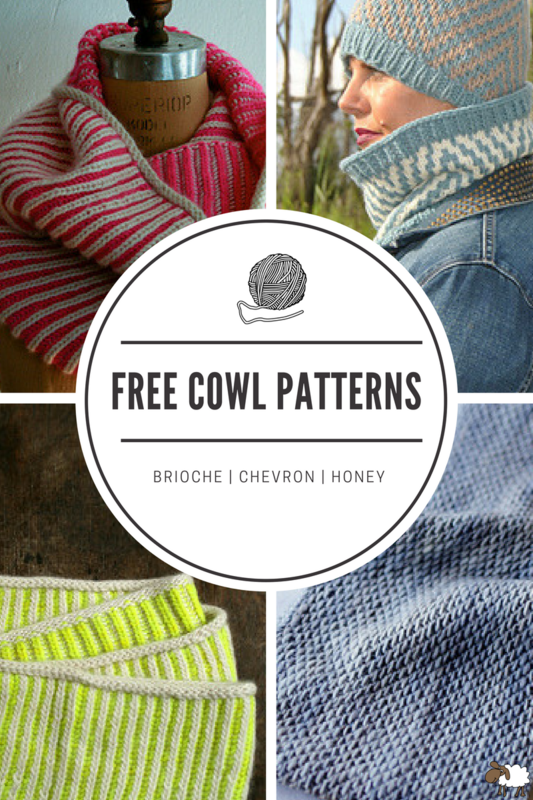 What are the best free cowl patterns? Here are my top three. This comes up because I haven’t always known the word. In fact, I remember rolling it around my mouth before I could say it aloud. It was just so weird. Cowl. Kuh-owl. Weird. But once I learned what it was (and how to say it) I was obsessed. Over the years I’ve made quite a few cowls (although before I knew they were cowls I just called them infinity scarves) as they make THE best gifts. And this year while Christmas shopping I even saw a cowl I’ve knitted sitting up on a mannequin at a cool millennial store. I mean, not the same one, but the same pattern. So. You know they’re cool. Since Christmas is coming SO SOON and I know you have some emergency knitting nights just around the corner, I’ve curated my top three hands-down favourite FREE cowl patterns. These are all on Ravelry so they’re easy to keep track of—just add them to your queue! Purl Soho’s Gina’s Brioche Cowl is one of the best free cowl patterns on Ravelry. I’ve used it to make SO many gifts…it’s such a stunning project and never fails to impress! To really make this pattern pop make sure to mix a neutral with a bright contrast colour. You won’t regret it! 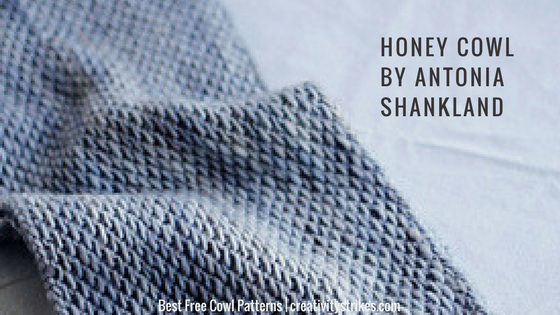 Honey Cowl by Antonia Shankland is one of my favourite free cowl patterns on Ravelry. Not only is it an interesting pattern but it’s a quick knit. Win win! I love wearing my Honey Cowl and one time I was boarding a plane and someone stopped me and asked, “Is that honey cowl?” I mean…come on! That’s amazing! Pattern designer Kristin Omdahl is new to me but I LOVE her style. Her Brave Cowl is one of the nicest free cowl patterns on Ravelry. I just love the Chevron pattern and this one is so dainty! Love it. While reading up on her I’ve learned she has an entire line of Be So Brave yarn, which donates partial profits to help victims of domestic violence. 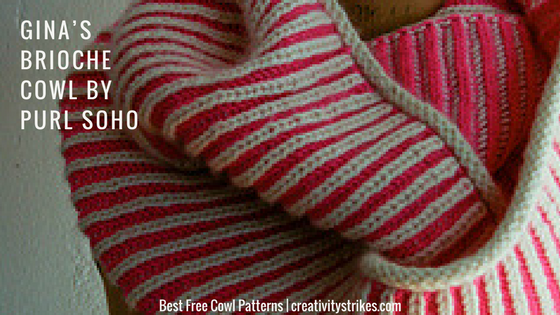 What’s the best free cowl pattern you’ve ever knit? Please share, I’d love to try it! Don’t forget to grab my free cabled boot cuffs pattern. Yours for the low price of your email address!